For those who believe anything on Facebook. 1908. Hula and the play “Umi-a-Liloa,” 1917. The hula alaapapa will be one of the special entre act features of the performance of “Umi-a-Liloa” at the opera house next Thursday evening. This hula is danced standing in contradiction to the older hulas which is called for a sitting position. It will be interpreted by a band of four young girls, who are experts in the art of the real Hawaiian dance. They are assisted by a man who beats the hula drum in old-time style. It is only in recent years that the hula has been accompanied by the music of instruments. Henry Nalaielua on KHBC, 1940. The one who will give short announcements when they air from the Naniloa Hotel on Saturday, December 21, during the entertainment in the program given by the Bohlings, and brought to you by the Hoku o Hawaii. Mr. Nalaielua will speak in “gibberish” (English) and the language pleasant to the ear to hear, that being our mother tongue, the Hawaiian language. Ka Hoku o Hawaii, Volume XXXV, Number 34, Aoao 1. Dekemaba 18, 1940. The most interesting of the fishery resources of the islands are the fish-ponds. This is the only place within the limits of the United States where they are found on such an immense scale and put to such general and beneficent use. The time of the building of many of these ponds goes back into the age of fable, the Hawaiians, for instance, attributing the construction of one of the most ancient, the deep-water fish-pond wall at the Huleia River on Kauai, to the Menehunes, a fabled race of dwarfs, distinguished for cunning industry and mechanical and engineering skill and intelligence. Many of the very old ponds are still in practical use and look as though they would last for centuries yet. As the ponds were originally owned by the kings and chiefs, it is very probable that most of them were built by the forced labor of the common people. There is a tradition amongst the natives that Loko Wekolo (Wekolo pond), on Pearl Harbor, Oahu, was built about 250 years ago, and that the natives formed a line from the shore to the mountain and passed the lava rock from hand to hand till it reached the shore where the building was going on without once toughing the ground in transit. As the distance is considerably over a mile, this speaks well for the density of the population at that time. The ponds are found principally in the bays indenting the shores of the islands, the common method of construction having been to build a wall of lava rock across the narrowest part of the entrance to a small bay or bight of land and use the inclosed space for the pond. They were also built on the seashore itself, the wall in this case being run out from two points on the shore, some distance apart, in the shape of a half-circle. Most of the Molokai fish ponds were built in this manner. A few were constructed somewhat interior and these are filled by the fresh-water streams from the mountains or by tidal water from the sea carried to them by means of ditches. Most of the latter are on Oahu, near Honolulu. The Nomilo fish pond at Lawai, on Kauai, is formed from an old volcanic crater with an opening toward the sea, across which a wall has been built, and as the opening is below the surface of the sea the tide plays in and out when the gates are opened. In the sea ponds the walls are about 5 feet in width and arc built somewhat loosely in order that the water can percolate freely. The interior ponds have dirt sides generally, although a few have rock walls covered with dirt, while others have rock walls backed with dirt. The sea ponds generally have sluice gates which can be raised or lowered, or else which open and close like a door. In the interior ponds there are usually two small bulkheads with a space about 8 feet square between them. Each of these has a small door which usually slides up or down. When the tide is coming in both doors are opened and the fish are allowed to go in freely. When the tide turns the doors are closed. When the owner wishes to remove any of the fish he generally opens the inner door when the tide is ebbing. The fish rush into the narrow space between the bulkheads, from which they are dipped out by means of hand dip nets. In the sea ponds the gate is opened when the tide is coming in and when it turns it is closed. There is usually a small runway, built of two parallel rows of loosely piled stones from the gate to about 10 feet into the pond. As the fish congregate in this runway when the tide is going out, it is very easy to dip out the supply needed for market. Seines and gill nets are also swept around the inside of the ponds at times in taking fish from them, and as they are quite shallow this is done easily. The sea ponds usually contain only the amaama, or mullet, and the awa. In the fresh and the brackish water ponds gold-fish, china-fish, oopu, opai [opae], carp, aholehole, and okuhekuhe are kept. Practically no attempt at fish-culture is made with these ponds. Besides the fish which come in through the open gates, the owner usually has men engaged at certain seasons of the year in catching young amaama and awa in the open sea and bays, and transporting them alive to the fish ponds. They are kept in the ponds until they attain a marketable size, and longer frequently if the prices quoted in the market are not satisfactory. They cost almost nothing to keep, as the fish find their own food in the sea ponds. It is supposed that they eat a fine moss which is quite common in the ponds. 1. The native population is dying off rapidly, and where there were prosperous and populous villages in the early years of the last century there is practically a wilderness now. Owing to this depopulation there would be no sale for fish in the immediate neighborhood of the ponds there, the only place where it could be sold owing to the difficulty in transporting fish any distance without the use of ice, and the ponds would naturally be allowed to go to decay, the walls breaking down from the action of storms, and the sea filling them with sand when they are located on the immediate shore. This condition of affairs is especially prevalent on Molokai. 2. Two of the important crops of the islands are rice and taro. As both must be grown in a few inches of water, and are very profitable crops, a number of the interior ponds were turned into rice fields and taro patches. Oahu has shown the greatest changes in this regard. 3. On Hawaii ponds were filled up by the volcanic lava flows of 1801 and 1859. The Kamehameha fish pond, which was filled up in this manner in 1859, was said to have been the largest on the islands. Only traces of it are now to be found on the beach. 4. At Hilo, on Hawaii, some ponds, mostly quite small, are so filled with the water hyacinth that it is impossible to work them any more. This year a few of the best of these were cleaned out, but as there is very little money to be made out of them, and their ownership is in dispute, there is but little desire to do much to build them up. 5. Other ponds have been filled up to make way for building operations and for other purposes. This is especially true of ponds in and around Honolulu and Lahaina. There used to be a number of fish ponds on Lanai, but they have all been allowed to fall into decay. A number of ponds are kept up by their owners merely as private preserves, as it were, the fish taken from them being either consumed by the owner’s household or given to friends. These are scattered all over the islands. [For the rest of this report showing the locations, names, and sizes of the many loko i’a across the Hawaiian Islands, and fish produced at the time of the report, etc., etc., see: U. S. Commission of Fish and Fisheries, Part XXVII, Report of The Commissioner for the Year Ending June 30, 1901. The fish pond report is a section of Commercial Fisheries of the Hawaiian Islands, by John N. Cobb, Agent of the United States Fishing Commission, which runs from page 381 to 499. 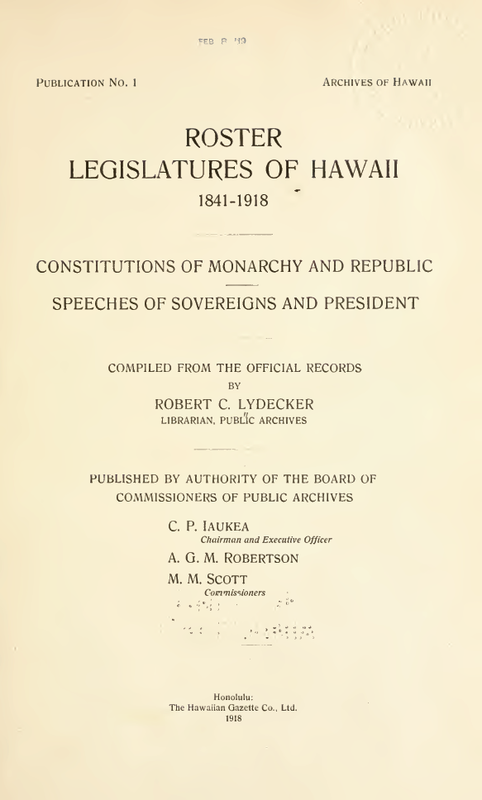 Roster Legislatures of Hawaii, 1841–1918. The Hawaiian Gazette Co., Ltd.
Alii from history who understood English, 1942. The Royal Men and Royal Women Who Knew English. Humehume, George P. Kaumualii, Jr. These High Chiefs of Hawaii nei, the men and women and important advisers of Kamehameha, all of them knew English. They were not limited at all, as if it was part of the Hawaiian language. Do remember, my conversation companions of the Hoku o Hawaii, the delicacies from which you get your fill, O Hawaii, which come from your kupuna, they will never be all consumed by us by gorging, as long as you continue to subscribe to our beloved spokesman, so that you may keep seeing the fatty delicacies of the birthing Stones of this land. There were many other alii who knew the English language, but these should suffice; and amongst the makaainana, the language of the haole (English) was wide spread; it was most widely known by the children, from those of the high to low classes. [This is from a regular column called “Na Iliili Hanau” [The Birthing Stones], written by George K. Kane, Sr., speaking on a variety of historical topics. Ka Hoku o Hawaii, Volume XXXVI, Number 42, Aoao 4. Aperila 8, 1942.